For 50 years, this single cinema palace provided a vibrant heartbeat for Bertram. It was a place for first dates and mental escapes during the rigors of the Great Depression. Sadly, after its doors closed in the 1980s, it sat collecting dust. That is, until 2009, when two childhood friends entered the scene. While others made attempts to buy the space, it was Zach Hamilton and Lance Regier’s genuine enthusiasm to restore the movie theatre that convinced the nostalgic owner, Tommy Knight, that it was time to let go. It took seven years for the pair to properly restore the theatre. Hamilton and Regier’s efforts included countless hours of manual labor and research. 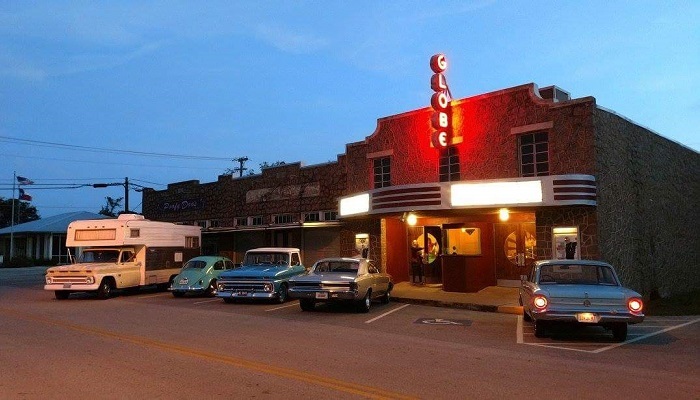 When it was rumored that Globe Theatre’s original marquee was last seen stored in an old dairy barn in Texas Hill Country, the duo tracked it down and had it restored to its original grandeur. 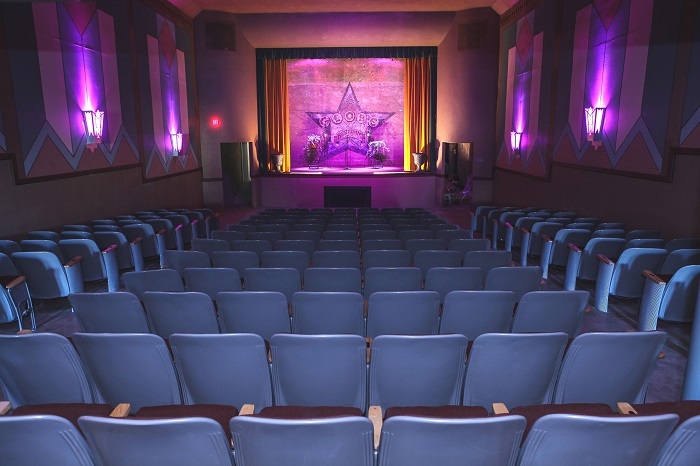 In 2013, the new owners ran a Kickstarter campaign with a goal to raise $25,000 to purchase renovated vintage theatre seats. They not only had to match the decor of the building, but they were determined to acquire seats matching the exact dimensions of the originals. Their campaign was a success, and 244 vintage folding seats with custom burgundy upholstery, metal backs and wooden arm rests were installed. The interior of the theatre feels like a time capsule. Art Deco design elements can be seen in light fixtures, door handles, fabrics and the flooring. An odd piece of modern-day pop culture hangs behind the concession stand, a black rotary phone (left behind in the ’80s). A dapper gentleman plays the part of usher, taking tickets and pointing patrons toward the pulled back velvet curtains framing the seating area. Wall sconces cast a soft blue glow over the space. The cinema’s seating (including a small mezzanine) is intimate and unhurried. When visiting Globe Theatre, be sure to bring your appetite. 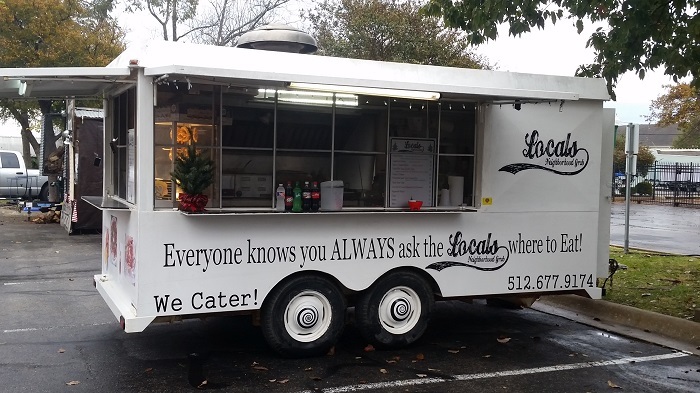 They’ve teamed up with Locals Neighborhood Grub, quite possibly the best food truck you’ve never heard of. The menu often changes. The night I arrived, “Grease” was playing, so we dined on diner classics with a Texas twist: brisket nachos, pulled pork tacos and cheeseburgers. The brisket and pulled pork were flavorful and moist (and gone before the opening credits were through). Inside you’ll find a quaint foyer with turquoise and cream tiled floors and a crescent-shaped stand selling standard movie fare: popcorn, candy, sodas. You’ll also find a selection of wine and four beers on tap. Unlike most 21st century movie theaters, the cost won’t break the bank. Most vittles are under $2. Even my “top shelf” Pinot Noir only cost $6. Globe Theatre remains a beacon that reassures because people like Hamilton and Regier still exist. They’re people who care about preserving the past, while nurturing a pastime that’s been around for generations. And it turned out the dapper gentleman who ushers on weekends is the same man, Mr. Knight, who reluctantly relinquished the property in 2009. The history of Globe Theatre has a physical heartbeat and hopefully will continue to flourish through the stories of those who fill the seats. Check out some of the upcoming shows at Globe Theatre, only 50 minutes away from downtown Austin! Which film would you like to see play at Globe Theatre?